Cultural Program at Chokhi Dhani with Traditional Dinner. You will be picked up at 5:30pm by our professional driver. After a drive of 20-25 minutes, you will reach Chokhi Dhani where your driver will provide you with your pre-purchased tickets and assist you with entry. 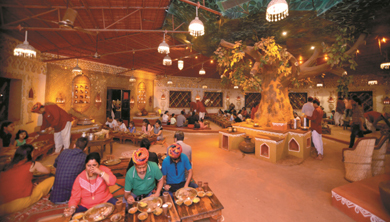 Chokhi Dhani is a beautiful resort, designed to offer its guests a Rajasthani experience. Enjoy a unique and traditional village environment where you can enjoy a magic show, puppet show, snake charmers, cultural and folk dances, along with a wonderful view of mud huts and cottages. Relax and explore for about 3 hours, per your convenience. You will also enjoy a traditional vegetarian dinner at the resort before being dropped back off to your hotel in Jaipur. Food Walk in Old City of Jaipur. from some of the most famous food joints of the Jaipur city. Some of them have been in business for more than 100 years. During the food walk, guests visit 8-10 food joints and taste 18-19 different dishes including one full-fledged meal at the end. None of the food items included are too spicy but can be made if so desired. 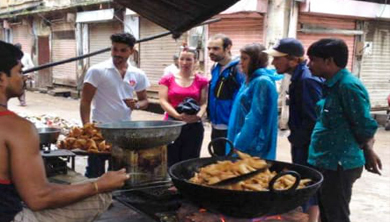 During the tour, we also visit a few attractions of the city like the biggest local market in city and more. Relish the contrasting flavors of the famous sweets and savories of the cuisine at time-tested eateries as you walk through the cities by lanes. Continue the eating spree with a large-hearted meal consisting of bread, curries, desserts and sweet lassi. Early Morning Vegetable & Flower Market Walk. You will be picked up from your hotel in Jaipur at 6 am. Drive from the city to Muhana Mandi, a large wholesale vegetable market. In the morning, the market is buzzing with activity as farmers from small villages arrive with their produce. After that you will visit an interesting fodder market at Sanganer, where farmers come to buy grass for cattle, and local Gwalans (women herders) bring their cows to be fed. Next, you will stop by the bustling Doodh-Mandi, where milk arrives in traditional cans, and is quickly snapped up by neighborhood Doodhwallas (milkmen) and confectionery shops. Finally, arrive at the flower market, & we will visit the last stop on our tour: the Govind Devji Temple. This is Jaipur’s most beloved Temple of Lord Krishna. The group singing and chanting of the morning Aarti (Morning Prayer) is lovely to watch. After your tour ends, you will be escorted back to your hotel in Jaipur. Diwali Celebration with Indian Family in Jaipur. 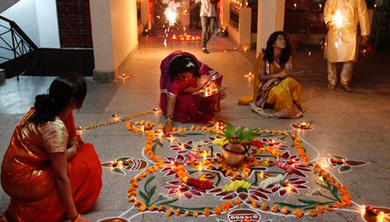 to join the annual celebrations of India’s Festival of Lights. Discover fascinating aspects of this ancient Hindu holiday, which includes temple prayers for prosperity and a traditional Indian feast followed by fireworks. Tuk-Tuk ride with Dinner at Narain Niwas Palace. On this Tuk-Tuk ride of Jaipur discover the vibrant colors of the city, which keep alive the 300 year old architecture and culture that the Mughals bestowed upon India. Visit the city in the evening and explore the antiquity of various monuments. You will also enjoy a delicious dinner at Narain Niwas Palace while watching a folk dance performance. Jaipur is a beautiful city during the day, yet it is even more beautiful at night. 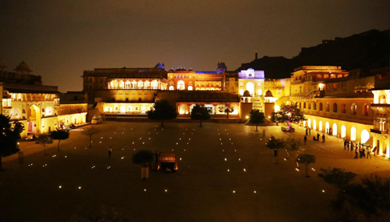 Get to know about the city and enjoy the beautiful night views of Jaipur. Dinner at Narain Niwas Palace. Evening Visit of Monkey Temple. 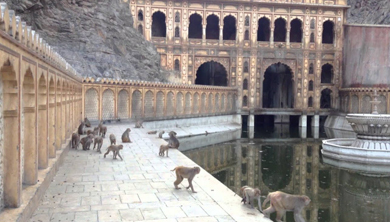 to the common name of the complex, the monkey temple. Galta Ji Jaipur is a unique Hindu temple as it is centered on a natural spring that has been channeled to fill seven large pools. In these pools pilgrims come to bath away their sins while, at quiet moments, the playful monkeys can be found swimming in the holy waters. The monkeys are of two breeds rhesus macaque and langur monkeys and both are completely unafraid of tourists, so expect to be mobbed if brave enough to feed them. The Galta Ji Jaipur temple is slightly off the common tourist trail but it makes for a pleasant half day excursion from Jaipur, while the short hike and high vantage point of the sun temple is the place to watch sunset. 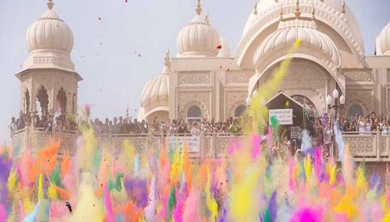 Celebrate the spring festival of Holi with a local family in Jaipur on a private 5-hour tour. You are welcome into the historical home of a noble family to enjoy the festival of colors. Dress up in traditional clothing, douse your friends with colorful powders, dance to popular Bollywood songs, watch traditional folk performances, and taste authentic local foods. Visit to Deaf & Dumb School. Visit Seth Anandi Lal Poddar Mook Badhir Senior Secondary School is an institution committed to cause of education, Vocational training and everyday growth of the deaf children and is run by Department of Education, Govt. of Rajasthan. The school which was started as back as in July 1945 with around 50 students has increased to 480 students in 2010-11 and 692 in 2014-15. The quality of education and training in the school has been well recognized and there is no list of students to get enrolment in the school. This has all been possible due to commitment and dedication of teachers and other staff to ensure good quality education / vocational training. The strength of boys and girls have been increased due to best facility and everything being free of cost, however, the teachers to teach students in sign language are not adequately available and likewise there is a great need for providing more hostel facilities for the boys and the girls from the rural and other remote areas as they cannot live in rented premises, due to inherent problems. Post visit we will drop you back to your hotel. along with providing a natural habitat for these giant animals surrounded by the Aravalli mountain ranges. 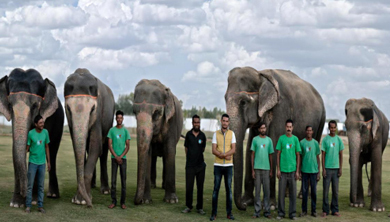 A day with Elephants is a unique and offbeat activity to offer a memorable Elephantiasic day to our guests in Jaipur not only by engaging in fun activities with Elephants but also giving it back to the community by spending some time the local community members. Head to a local home in Jaipur for a 3-hour cooking lesson and meal that teaches you to prepare authentic North Indian food. 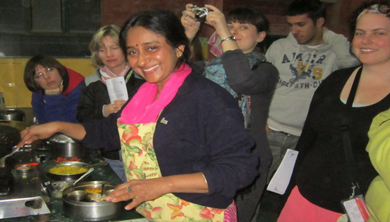 Experience India's culinary traditions firsthand as your host leads a hands-on lesson in her private home, showing you how to make 4-6 dishes that are typical of the region. You might cook aloo gobhi (cauliflower and potatoes), flavorful curries, handmade Indian breads, and dessert. When the meal is ready, share the food and further conversation with your host. Early Morning Bicycle Tour of Pink City. 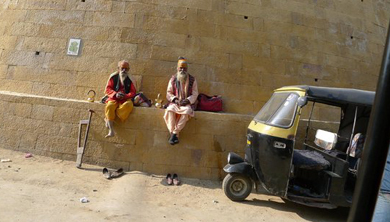 this tour will immerse you in the authentic Jaipur experience. Experience heritage architecture of old havelis and age-old divine rituals being held in ancient temples. 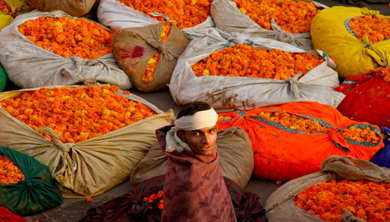 Discover the colorful hustle and bustle of early morning fruit, flower and vegetable markets. Be a part of friendly morning tea stall meetings and sip delicious cha-tea. Click pictures of scenic spots in the incomparable morning sunlight. Listen to interesting tales and tidbits behind the sights. Wrap up the amazing experience with an appetizing breakfast at old Jaipur’s oldest coffee house. 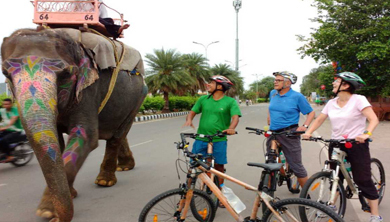 Traveling at a comfortable pace, this tour works for experienced as well as inexperienced cyclists. Early Morning Heritage Pink City Walk. Meet up with our local guide at Hawa Mahal and let him introduce you to the city. Enter the City Palace complex and discover the Royal Heritage of Jaipur. Walk up to the most famous temple of Jaipur and witness a Hindu prayer ceremony. Dive in the biggest vegetable wholesale market of Jaipur and enjoy the lively ambiance and colorful scenery around you. Don't miss the Flower market on your way and see the farmers selling their products. Walk up to the marble carver's district and meet local artisans on your way sculptors, silversmiths, bangle makers, metal workers and learn from their traditional methods. Jaipur is the capital of Crafts! You will be picked up from your hotel at 5am or 2pm, depending on your selected departure time. Head to Jhalana Safari Park, which takes about 30 minutes. Upon arrival, we will move inside the state park. There are two zones in the park. We will first proceed to the first zone to see many different species of birds, along with animals like the spotted deer, jackals, hyena and blue bull. 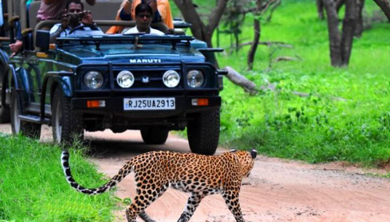 If you are lucky, you might even encounter leopards in this zone. Afterwards, we will move towards zone 2 where we will try to spot more leopards. You will also enjoy off-roading in the jungle, which is a unique experience. After spending approximately 3 hours in the state park, we will move out of the park. Later you will be dropped at your hotel or resort in Jaipur. Excursion to Sanganer Textile Village. Proceed to Sanganer, which is a small town located at a distance of 40 km from Jaipur. 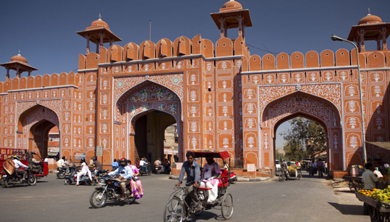 The town in Jaipur is known for its art and craft work that attracts tourists from different parts of the world. Renowned for its handmade block printing and paper making workshops, it offers tourists an opportunity to see the entire process. The print work in the town comprises of floral and folk designs that displays the huge influence of the Mughals, which are created using, vegetable dyes and floral motifs. Once you have observed closely the process of block printing at Sanganer, we take you to explore the skill of handmade paper. Next on the Sanganer Day Trip from Jaipur is a visit to the Jain Temple. The structure and architecture of the temple, is said to be a replica of the Dilwara Temple, which is in Mount Abu. It has spectacular design and it is worth a visit. As the tour comes to an end, we take you back to Jaipur. Sunset Visit of Nahargarh Fort. The Nahargarh Fort was built by Sawai Raja Jai Singh in 1734. Since Jaipur was his capital, the Nahargarh Fort was strategically important and was built as a means of bolstering the defense of Amer. It was also known as the Tiger Fort. The older parts of the fort are being hard hit by the ravages of times but the newer additions are quite captivating. According to a legend, the Fort was named after a prince whose spirit used to haunt the site and would cause mischief so as to delay the construction of the fort. After too many disturbances, finally after a Tantrik prayer the ghost or the spirit, agreed to leave on the condition that the fort should be named after him. One of the major attractions of the Nahargarh Fort is the view it offers of the Man Sagar lake and the surrounding area. Sound & Light Show at Amber Fort. 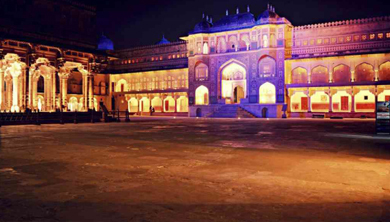 The sound and light show at Amber Fort is a glorious attempt in reviving the pride, history and traditions of Amber. The show highlights the local legends, folklore, and celebrates the maestros of folk music, who, to this day, continue to give Rajasthan its unique identity. The show has been set in a spectacular location, with a brilliant view of Amber Fort & Palace Complex in the front, the rising Jaigarh on the left, and magnificent hills behind it. Amber by Night with Dinner. Pick up from your hotel and transfer to Amber Fort. Before moving to Jaipur, the fort palace of Amber was the capital of the Kachwaha clan. The honey-colored citadel rises gradually along a sloping ridge surrounded by even higher ridges capped with other battlements and watchtowers. From the beautiful geometric gardens and Maota Lake, you can roam up to the main square, Jaleb Chowk. From here, wander freely through the palace grounds, halls of audience, the magnificent three-storey Ganesh Pol, the once-taboo zenana (women’s quarters) and the still-glittering Jai Mandir. Later enjoy dinner at 1135 AD restaurant. Post dinner drop back at hotel. 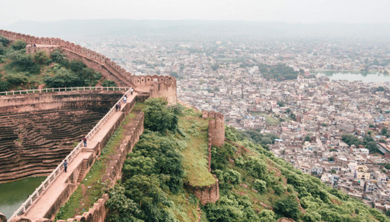 Swap the crowded street of Jaipur for sightseeing from the sky. This exciting balloon safari will introduce you to the Pink City from a whole new vantage point. Have the ultimate stress-free day with hotel pickup, and drop-off included. Once you get to the launch site, you’ll have light refreshments before taking off. The tour will reveal panoramic views that you wouldn’t see otherwise. 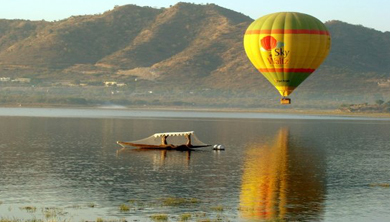 Soar over hidden palaces, remote villages, the Aravalli Mountains, Amber Fort, and much more.